Sometimes, we share what’s in our hearts, other times it’s what’s in our heads. 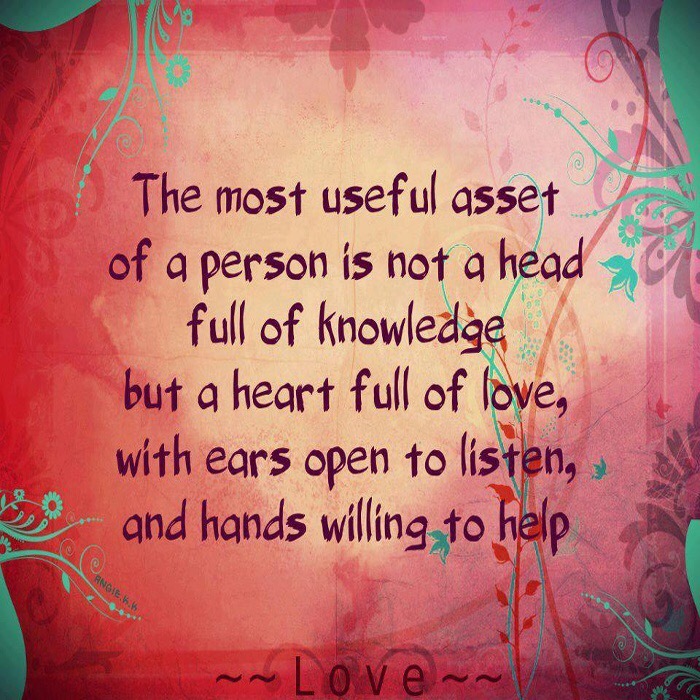 Today, I choose to take a minute to implore you to have a heart full of love, with ears open to listen and hands willing to help. The most important asset is not a head full of knowledge. What’s the use of being knowledgeably selfish or knowledgeably unkind? Knowledge is the half way point. Using the knowledge for the benefit and upliftment of human kind is when you really begin to fulfil your purpose. I’m on a journey of self-discovery to make a positive difference to the lives of as many people as I can, in any way I can, for as long as I can. Why not join me? Previous Post Feeling the love in 2016! Next Post Gems to share…The Human Touch!💖✍🏾 way! I am in. You are right, knowledge is halfway point. We have to use it to make the world a better place. Nice post. Thank you for writing this Nichole. I’m with you. Fantastic blog and post Nichole. i’ve always believed in loving unconditionally. We love without any conditions ,but pure compassion . Well done, like i always say , i see a beautiful soul in you ,and a beautiful mind . This post has struck a chord with many readers. Living a knowledgeably compassionate life is the way to go!